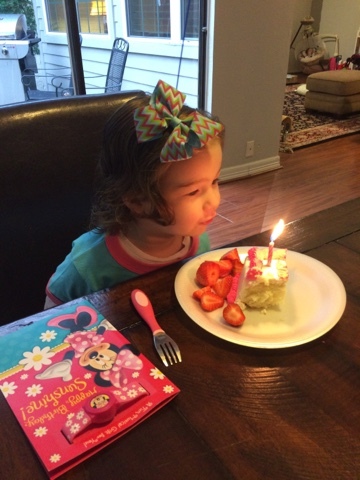 Happy 3rd Birthday to my Charnado, aka Shirley Temple (what you say is your name every time you are asked). We’ve had a great day celebrating you: cake for breakfast, the park with your cousin, and an afternoon playing at home. I told you I would make you a special birthday lunch and with excitement you said, “A peanut butter and jelly sandwich? !” DONE. In 3 years, you have gone from a tiny helpless baby to an independent, firecracker little girl. You live life with everything you’ve got, always full speed. You move and talk at a rate that I find difficult and exhausting to keep up with, but I love trying. You are emotional, stubborn, and opinionated- all traits that frustrate me to tears some days, but that I secretly greatly admire. I know you will do big things with your life and influence many with that personality of yours. THIS. This is YOU in a picture. -Sleep 12-13 hours at night, and never give us any trouble at bedtime. 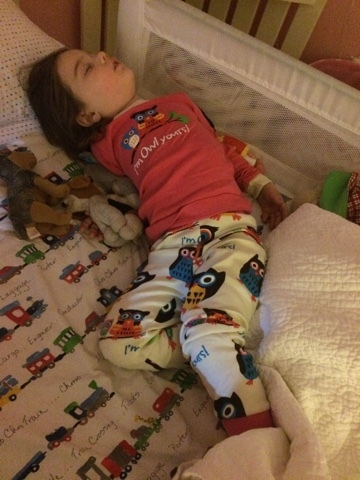 You sleep with at least 20-25 toys/books/stuffed animals a night and sometimes wear shoes to bed. But because you sleep so well, I don’t have any issue with that. -Are a sweet big sister to Nolan and are coming back around to Grayson. 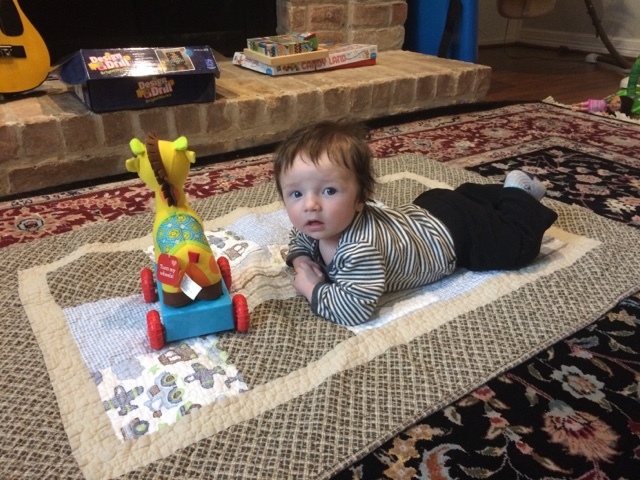 Since Nolan was born, you’ve taken a lot of your angst out on your GG (especially when we have to leave the house to take him or pick him up from school). Lately though, you’ve been asking a lot to get in his bed with him, so we’ve been letting ya’ll have sibling bonding time. -Adore your Daddy and go on lots of “dates” with him, usually involving the park and ice cream. – Are really struggling with potty training. You have no real interest and to be honest, I’m frustrated. I know you will do it when your ready, and I’m trying to figure out how to be firm, yet encouraging and positive. – Are rarely silent and ask a million questions a day. You will ask the same question over and over and over if you aren’t satisfied with the answer. Yesterday, I “interviewed” you. I planned to write down questions so I can ask you the same ones every year, but well, life is crazy these days and that didn’t happen. I thought we both did a good job on the fly, though. You are pretty cute, little girl. 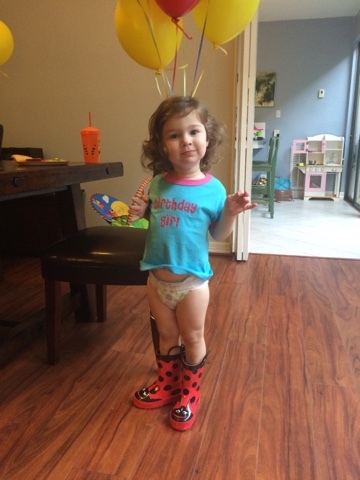 Happy Birthday Charlotte Faith. I’m so glad I’ve had the past 3 years to hang out with you- you make life FUN! Every morning around 10 am, I have an urge to write in this space. I have ideas, sentences and paragraphs form in my brain and I want to get them out. And I promise myself that after the kids are in bed, I’ll sit and blog. But then I don’t. 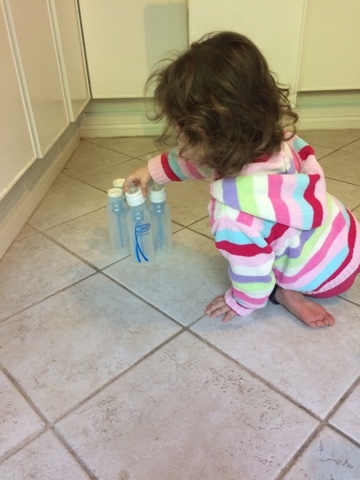 Parenting three is hard- it just is. I didn’t get one minute of a break today for 12 hours. It’s 7:36 pm, and I’m in bed- my body aches and my brain is done. But this blog is still so important to me, for me, and I want to capture what I can, when I can. And tonight that means a phone photo dump. So here they are- my favorites from 2016 so far. As you know, I struggle(d) a lot with having to supplement Nolan with formula. 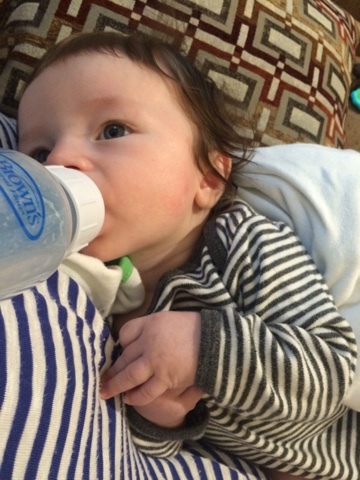 But you know what’s totally awesome that doesn’t happen with breastfeeding?This eye-lock while he’s bottle feeding. Love. Putty is fun for everyone! 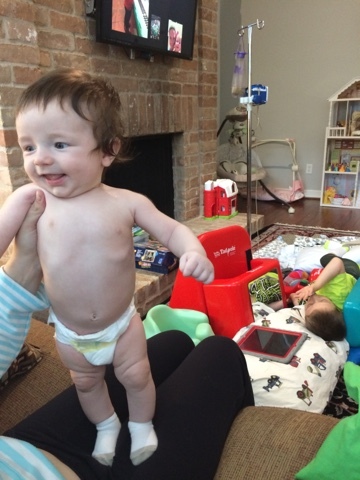 Poor kid has his parents’ body type- loooong torso and short legs. 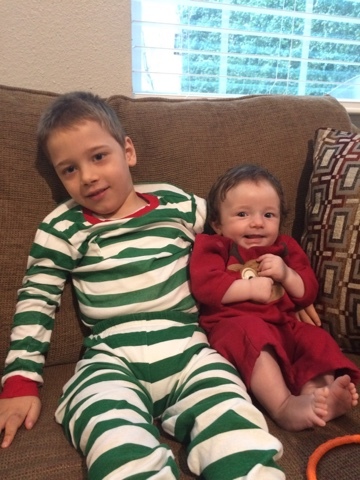 So this was Christmas morning, not 2016, but how sweet are these brothers? You would melt to see how they love each other. 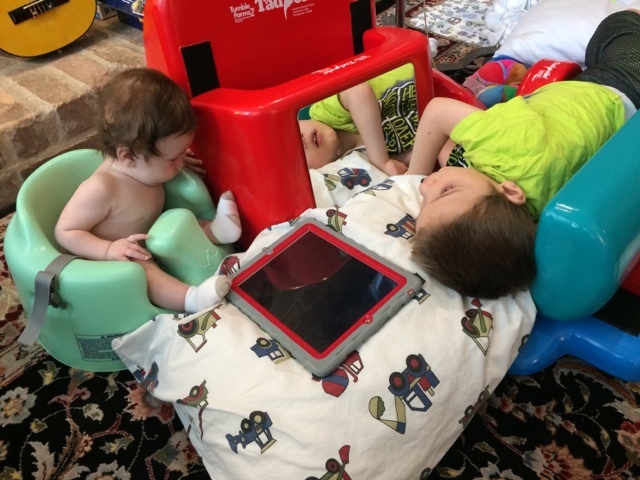 It’s kind of amazing to watch two non-verbal kids express joy with the other. And then there’s these two. 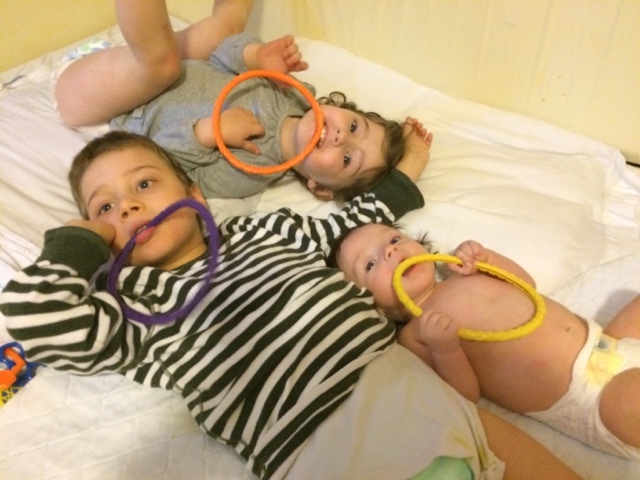 These rings are Grayson’s very favorite thing- they are easy for him to hold and chew on. Apparently he’s not the only one who is a fan. 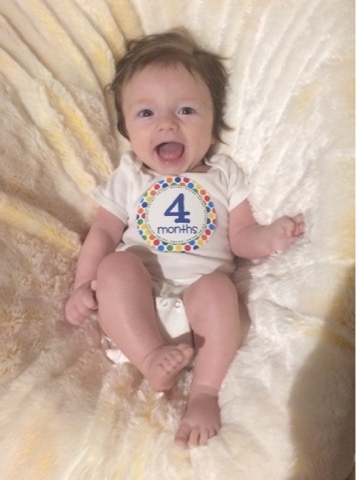 Happy 4 months and Happy New Year little guy! We are just wrapping up your first Christmas and I definitely tried to soak up the season with you, my last little baby. There’s just something really special about having a baby at Christmas, and I’ll miss it. You have grown and changed a lot in the past month. For starters, you gained 2 pounds! While you are still tiny for your age (as were all Baker babies) you now have an adorable double chin and squishy thighs. The best part of this past month was last week when you started to laugh. It’s just the best, and really, so much more pleasant than your crying. And speaking of crying, why do you do that so much? You have earned the nickname Grumpy Gus, because you are the moodiest little guy. You still refuse to be put down for more than a few minutes at a time and just generally fuss a lot. To your credit though, I think your tolerance of the car has gotten a bit better- you know longer scream hysterically every time we go anywhere. So thanks for that. This week, I decided we need to figure out if your fussiness is food related, so I’ve started by eliminating dairy from my diet for breastfeeding and supplementing with a hypoallergenic formula. You don’t have any other signs of a food intolerance other than your crying, but it’s worth a shot to see if it helps. – Are breastfeeding and eating formula about every 3-4 hours during the day. 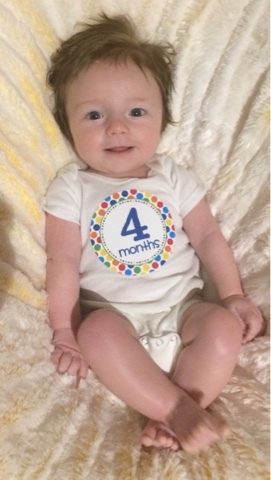 We had a weight check right after you turned 3 months and your doctor and I decided it would be best to supplement with formula to get you gaining a little faster. It made me sad, but I am thankful and relieved we are doing what we need to do to make sure you grow and stay healthy. – Are not napping consistently. 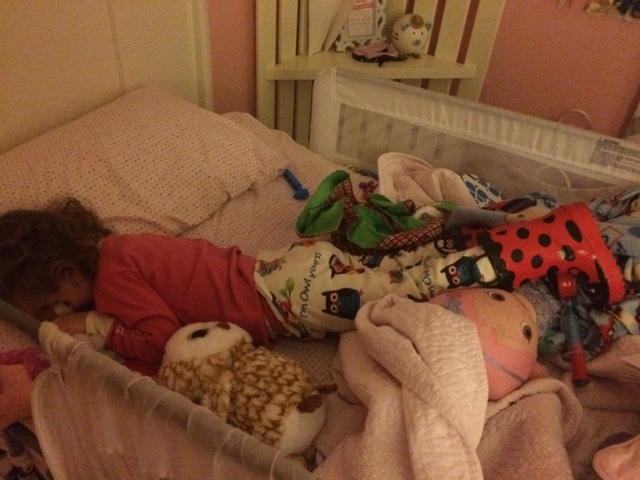 Your pack and play that you sleep in is in our room and I think the room is too light during the day. We may need to look into getting a blackout curtain until we move and you get your own room and crib. – Go to bed around 5:30 pm and sleep a 7-9 hour stretch. You wake up to breastfeed, go back to sleep and are usually up for the day around 6:30 am. – Are losing some of your gorgeous hair in the back, which makes me sad. I am also sadly losing my hair- post-partum hair loss is the worst! – Adore your siblings, and the feeling is mututal. Charlotte always wants to know where you are and loves talking to you and saying your name (No-laaaan) and Grayson loves looking at you and patting your face and hair. This week will mark one year since we found out you were going to join our family. We had prayed for you and were so thankful to be expecting one last little miracle to complete our family. 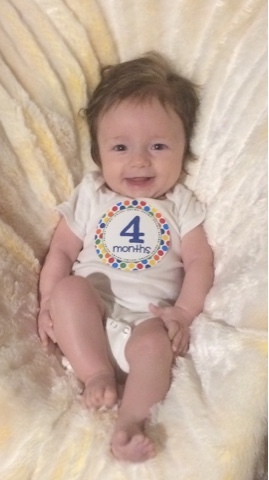 And here you are, one year later, the cutest little 4 month old sound asleep upstairs. God is good. 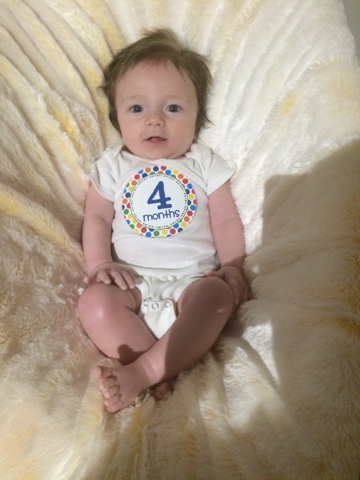 Happy 4 months Nolan Reid! I’ve read quite a few year end recaps today, and it seems like 2015 wasn’t too kind to anyone. And just like 2013 (my last really hard year), I’ll be glad to close the door on 2015 and am looking forward to a hopefully much calmer, uneventful new year. I spent 2015 just surviving. I was pregnant for the majority of the year, and was sick and/or nauseus all 9 months. 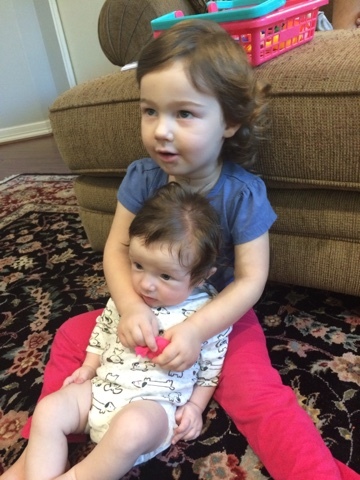 Charlotte turned two and got a baby brother, which evidently wasn’t a great combination for her. 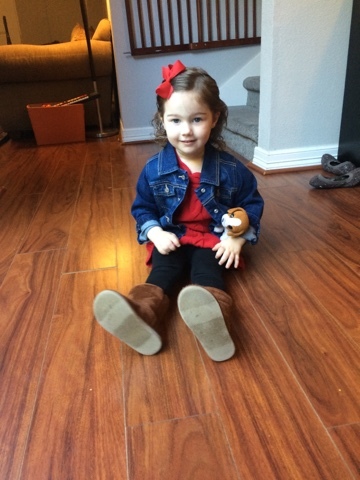 We had some really, really challenging months with her; thankfully, lately she’s come around and is back to her hilarious, sweet self and is generally pleasant to be around. 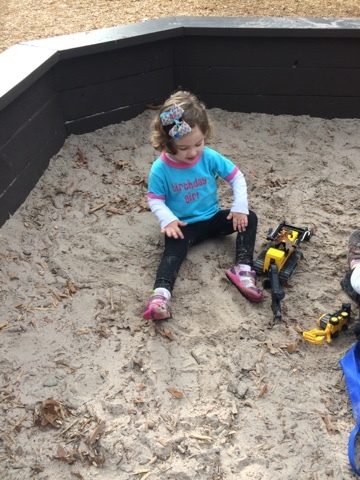 She turns three in January and reminds me frequently that we will be celebrating the occasion with a Play-doh Cake (???) and NO MORE DIAPERS (oh please God, let this be true). Grayson has had a really great year in terms of not being sick. He hasn’t had a seizure since Valentines Day and was only hospitalized a few times other than his surgery. May 5 was his big hip reconstruction surgery, and we had a very long, hot summer helping him recover. 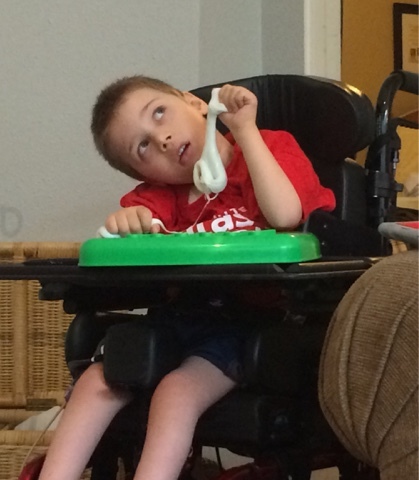 Unfortunately, any relief the surgery gave him with his spasticity is gone, and he is really struggling right now. His body is so stiff, and we are having an awful time keeping him in comfortable positions. He’s also back to gagging and retching constantly, which is frustrating because it makes him miserable and nothing we do seems to help him. He will have to have a second surgery, probably this summer, to remove the hardware from the first surgery. The end of the year always brings much thankfulness that we still have our sweet boy with us. 2015 also marked the end of our family building. This is definitely bittersweet. I’ve had three wonderful birth experiences and it makes me sad I won’t get to do that again. And I love babies. But this last pregnancy, while parenting two others and being so sick, almost did me in. And our resources for parenting- finances, time, patience, seats in our van, sleep- are maxed out at three. And Nolan, God bless that sweet baby, isn’t easy. 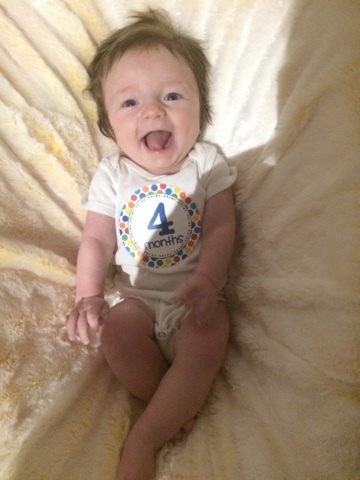 He turns 4 months old tomorrow, and while it seems like this last infant period is just whizzing by, I’m ready for him to start playing with toys, napping better, and for the love, stop crying so much. Now that our family is complete, I hope that we can really start living, and not just surviving. I pray sooner than later this year we can move into a house that works for our family, because our current one just isn’t. My goals for 2016 are to drive (way) less, spend a ton more time outside, read more books, and only have 2 kids in diapers. I hope 2016 brings you and your families much joy and happiness. Happy New Year!